Location of Charlotte Center for Facial and Laser Surgery. See map, below, for our location. 1. Take Park Rd South to Johnston Rd, go 0.5 miles (2nd light) past I – 485, turn L on Ballantyne Commons Rd, go 1.9 miles (3rd light) to Elm Lane. Turn L onto Elm Ln and then another immediate L into the Forum at Ballantyne Commons. 2. Take Colony Rd past South Park area. Turns into Rea Rd before Hwy 51. Go 0.5 miles (2nd light) past I – 485, turn R onto Ballantyne Commons Rd, go 0.2 miles (1st light) to Elm Lane. Turn R onto Elm Ln and then an immediate L into the Forum at Ballantyne Commons. 3. Take any road to Providence Rd and head away from central Charlotte; turn R onto Hwy 51 (at Arboretum shopping center). Go 1.9 miles (4th light) to Elm Ln, turn L onto Elm Ln, go 1.9 miles and turn R into parking lot for the Forum at Ballantyne Commons. Take I – 485 East (exit 2 off of I – 77 South) to Rea Rd exit (exit 59 off of I – 485). Turn R at end of ramp go to 2nd stop light (approximately 0.4 miles) and turn R onto Ballantyne Commons Pkwy. Go to next stop light (0.2 miles) and turn R onto Elm Ln. Make first L into the Forum at Ballantyne Commons. Take I – 485 East (exit 1 off of I – 77 North) to Rea Rd exit (exit 59 off of I – 485). 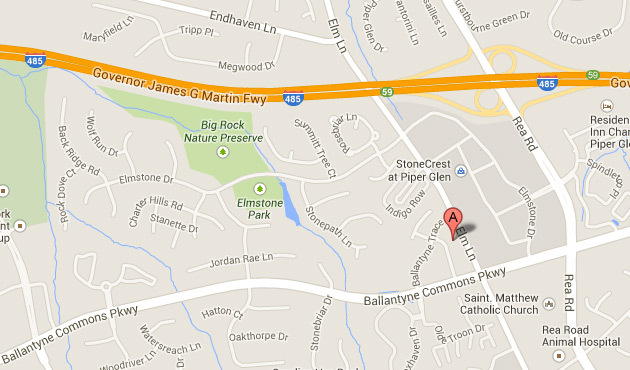 Turn R at end of ramp, go to 2nd stop light (approximately 0.4 miles) and turn R onto Ballantyne Commons Pkwy. Go to next stop light (0.2 miles) and turn R onto Elm Ln. Make first L into the Forum at Ballantyne Commons. Take I – 485 (exit 48) toward Rock Hill. Travel about 28 miles and exit on Rea Rd (exit 59). Turn L at light and the end of the ramp onto Rea Rd. Go 0.5 miles (2 stop lights) and then turn R onto Ballantyne Commons Rd. Go 0.2 miles (1 stop light) to Elm Ln. Turn R onto Elm Ln and then an immediate L into the Forum at Ballantyne Commons. Take I – 485 South (exit 30 off of I – 85 North) towards Pineville. Go approximately 17.5 miles to Rea Rd exit (exit 59). Turn R at end of ramp, go to 2nd stop light (approximately 0.4 miles) and turn R onto Ballantyne Commons Pkwy. Go to next stop light (0.2 miles) and turn R onto Elm Ln. Make first L into the Forum at Ballantyne Commons. Take Rea Rd exit (exit 59 off of I – 485 West), turn L at light at the end of the ramp onto Rea Rd. Go 0.5 miles (2 stop lights) and then turn R onto Ballantyne Commons Rd. Go 0.2 miles (1 stop light) to Elm Ln. Turn R onto Elm Ln and then an immediate L into the Forum at Ballantyne Commons. Take Rea Rd exit (exit 59 off of I – 485). Turn R at end of ramp go to 2nd stop light (approximately 0.4 miles) and turn R onto Ballantyne Commons Pkwy. Go to next stop light (0.2 miles) and turn R onto Elm Ln. Make first L into the Forum at Ballantyne Commons.